The trio tackles everything from beatboxing "Fur Elise" to rocking Destiny Child. For better or for worse, the world of the classical arts can seem inaccessible. "Chamber music is too fancy for me," you might say. But what happens when a cellist, a bassist, and a flautist perform, say, the theme song from "Pinky and the Brain?" Or when the flautist beatboxes a medley of "Für Elise" and Destiny's Child's "Jumpin' Jumpin'?" Or when you realize that these three musicians – collectively known as the Project Trio – have a YouTube channel with more than 73 million views? Throwing the traditional notions of chamber music to the wind and instead incorporating music ranging from pop, rock, hip-hop, and classical, Project Trio has created an accessible, approachable, and fun take on chamber music. And to wrap up a week-long artist-in-residency program in Erie, the group will be performing two shows Saturday, March 28 at the Walker Recital Hall on the campus of Mercyhurst University. 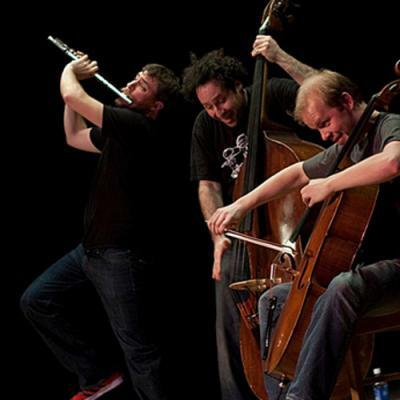 The high-energy group, based in Brooklyn, is made up of beatboxing flautist Greg Pattillo, cellist Eric Stephenson, and bassist Peter Seymour. They blend the old and new, and the group's mission to bridge the gap between classical music and popular culture to expose and engage younger audiences. While early arrivals to both the 2 and 7:30 p.m. shows can experience the lobby of Walker turned into an art gallery (thanks to the Photographic Art Society of NWPA), early birds to the 2 p.m. show get an additional special treat. The Mercy Center for the Arts is providing hands-on musical activities for kids, and artist (and Erie Reader contributor) Bryan Toy will be drawing caricature portraits.